Esc Problem - No Power???!?! So the other day my ESC came to a very hot and sputtering stop. So I decided to get a new Plush 30A ESC to replace it. After much foam carving to get at my bixler's connections, I finally replaced the ESC. I plugged it into the receiver and into the motor to give it a test. However, after plugging in my battery, I immediately noticed that there was no beeps. I gave a bit of throttle... nothing. I checked for a red light on the receiver... nothing. 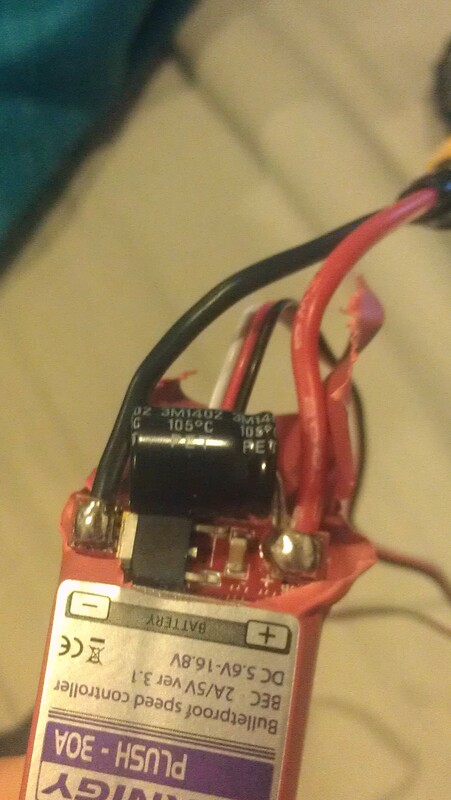 I then plugged my old ESC back into everything and tried it and it worked. Plugged new ESC in... nothing. I opened up the heat shrink to look at the solder joints for the battery connector. Everything seemed fine. There is a picture below. Is my ESC dead??? Can I fix this??? Check to make sure you are getting power to the board from your battery leads. Could be the xt60 plug/ solder. Should power receiver even if throttle end points are not set.